Written by Janet Choi on January 19, 2017 . Super users don’t crop up overnight. Your customers first have to learn how to use your product to become experts and advocates. 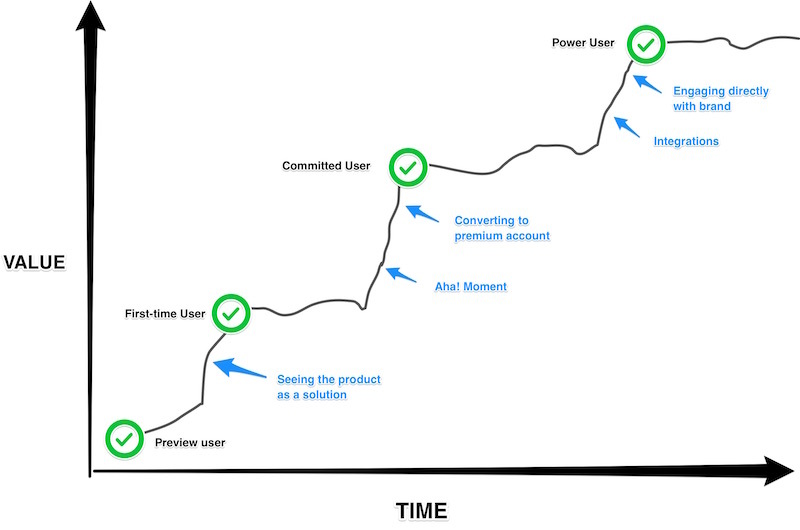 As people experience the value of your product over time, they take different kinds of actions within your app. Pulkit Agrawal, CEO of Chameleon, uses this model for understanding the customer lifecycle. A First-time User wouldn’t take advantage of integrations without understanding the product, for example, while a Committed User would. source This progression doesn’t just happen. You can’t throw a plant in a pot and hope that rain falls—you have to water it and battle bugs. How do you nurture the newbie to become a power user? Segmentation! By grouping your customers based on specific user and event data (like logins, plan level, in-app actions), you can address whatever product engagement lifecycle stage they’re in. Unlike static newsletter lists, segments based on behavioral data are dynamic, meaning that users move in and out of them automatically based on their actions. Once you’ve defined segments, you can send them contextual lifecycle emails, tailored to each individual user’s journey through your app and guiding them to grow from Preview Rookie to Power User. Let’s dive into what goes into creating these segments, using Customer.io‘s segment builder to illustrate, as well as what kind of message to send to each group. When reaching out to a Preview User segment, your goal is to get them over the first hump of using your product. 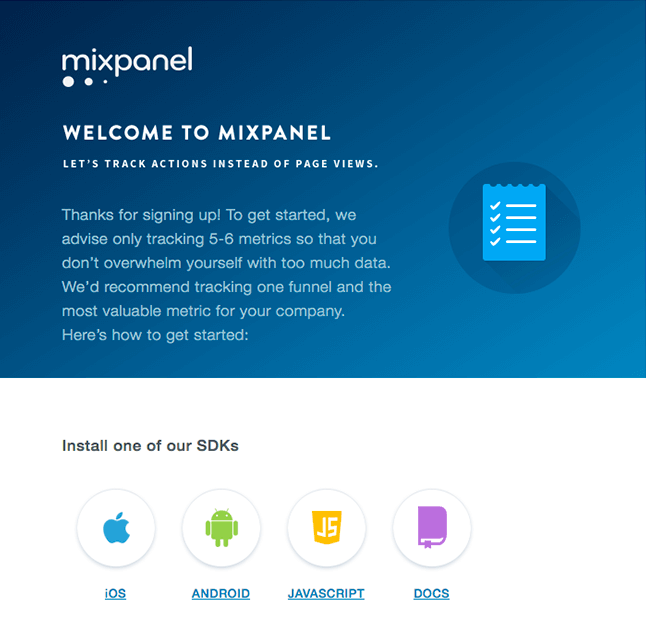 This welcome email from analytics company Mixpanel does just that. It prompts users to install an SDK and gives them the code to track their first event, which is the product’s core function. source: Really Good Emails (click through to see full email) Nudging Preview Users to experience your product’s value helps turn them into First-Timers. Your First-Time Users understand how to use your product but they don’t fully get what problem it solves. (These aren’t necessarily people who have only used your product once.) That means the new product probably isn’t going to stick. A First-Time User of the survey tool, for example, may have used it a few times, but without really understanding how to use it for specific goals like conversion rate optimization. 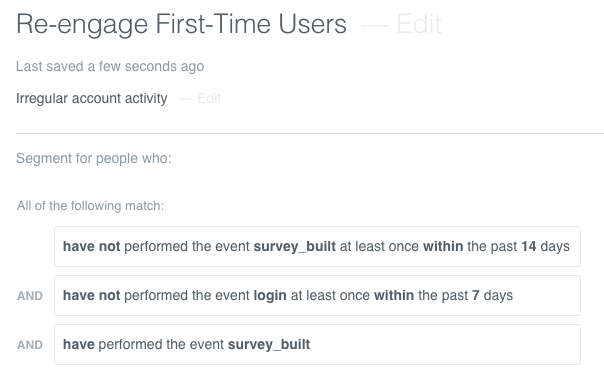 This sample segment of First-Time Users has 3 conditions to find anyone who isn’t regularly active in the product yet. People in this segment have (1) used the tool at least once before, but they haven’t been show up recently—(2)not having logged in for a week or (3) built a survey in at least 14 days. The behavior of users haven’t been logging in or creating a new survey in awhile is signalling that the product hasn’t become a consistent solution yet, despite having completed one key task. That’s a key opportunity for a nudge. To motivate people in this segment of first-timers to come back, teach them how you can help reach their goals. They may know how to use the basic functions your app by this point, but now it’s your turn to continue conveying the why. 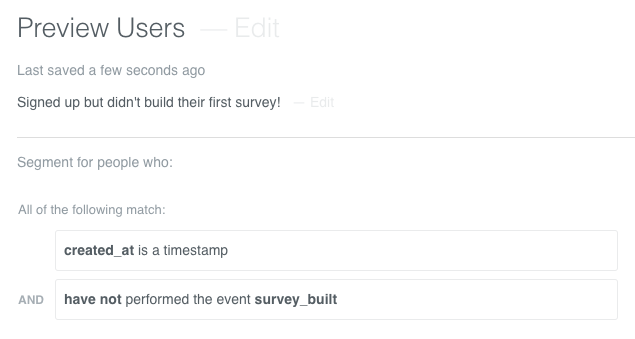 Typeform, for example, is a product that helps you create online forms, surveys, and quizzes. The first-time user may understand just that fact, but not how to apply the product to their larger goals. 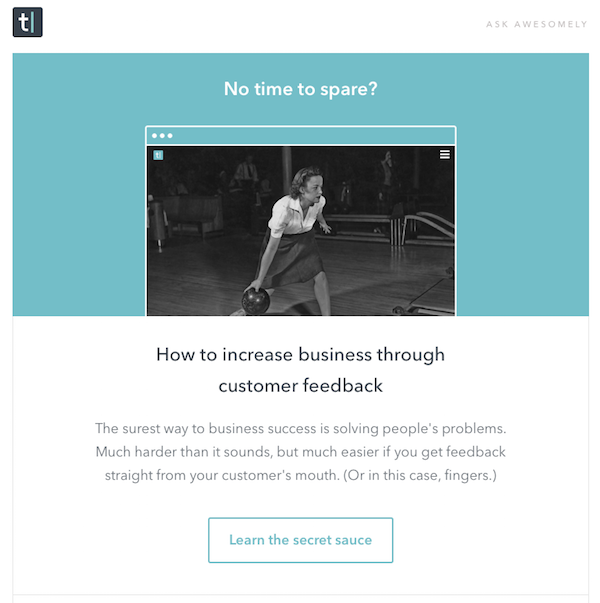 In this email, Typeform provides the “why” by prompting users to learn about how customer feedback can grow their business. Pretty persuasive! Educating your users about why your product fits in with their goals will help move them forward from a First-Time User to a Committed User. Your Committed Users use the core function of your product regularly—but not yet to its full potential. There are features they haven’t yet explored, hacks they haven’t tried. For an app like Qualaroo, this might be the user who checks their survey results nearly every day but hasn’t thought to integrate with Salesforce yet. 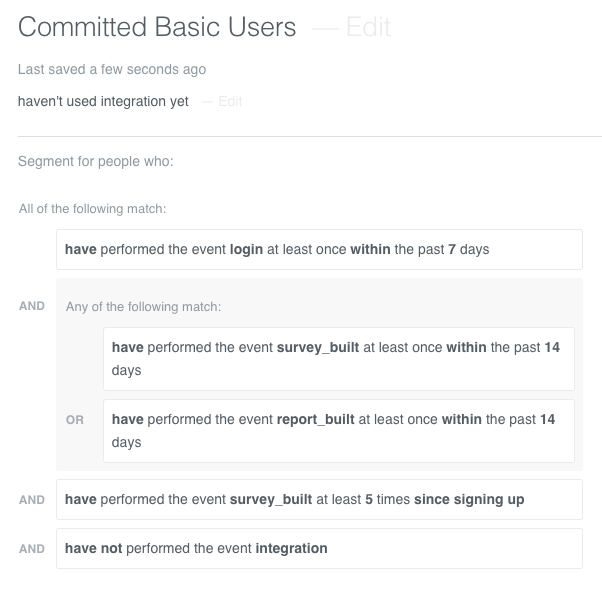 Here’s a sample Committed User segment for our fictional survey tool. This segment matches users who are pretty active but can level up their product engagement by using an integration. We’re grouping together anyone who’s been active recently (logged in within the past week and built a survey or report in the past 2 weeks) and over a period of time (they’ve built at least 5 surveys since signing up)—but they never used the integration. A segment like this targets people who use your product fairly regularly, giving you the opportunity to make your case to deepen their engagement. Emails for Committed Users can focus on making sure they check out all the cool features and tricks in your product they might not know yet. That might mean educating people on a specific advanced feature or providing more inspirational and instructive use case stories. Let’s go back to Typeform for another example. 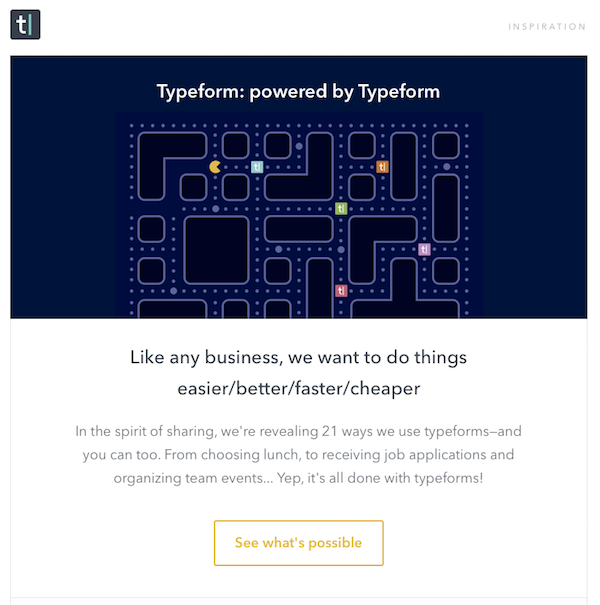 This email dives into how Typeform uses their own product in 21 ways, showing how you, too, can do things easier/better/faster/cheaper. A message elaborating on the core function of your product can motivate your Committed Users to expand their product knowledge and become Power Users. 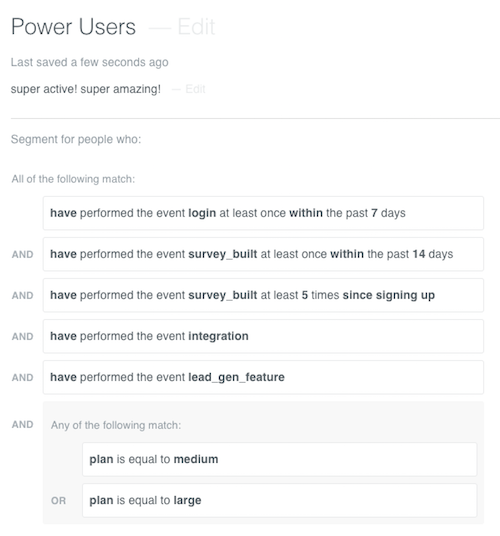 The Power User segment for a survey tool could look like this: users who have logged in within the last week, built a survey within the last two weeks, used the lead generation feature, taken advantage of an integration, AND are on one of your higher-priced plans. This group has a comprehensive knowledge of your product’s features and is using it regularly. Let’s keep it that way! Messages you send to your Power Users should aim to keep them powered up (informed about product updates/hacks) and invite them to share what they’ve learned through blog posts, social media, case studies, and referrals. 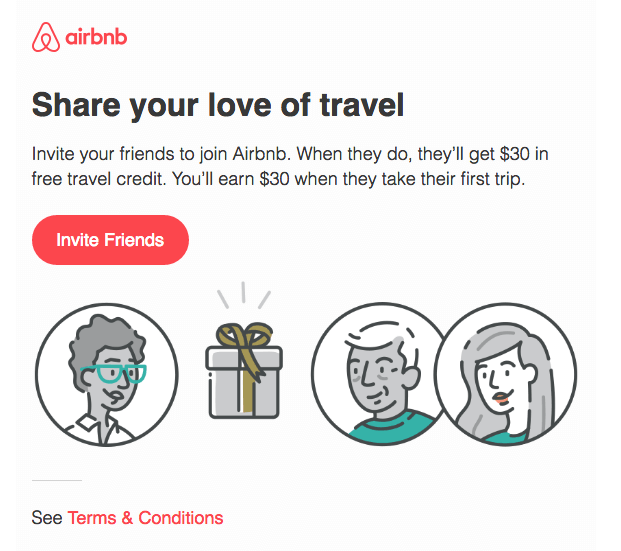 This email about Airbnb’s referral program incentivizes Power Users to share the app with their friends with $30 towards their next travel credit. source: Really Good Emails Emails like this help your Power Users sing your praises—and bring on new Preview Users to start the cycle over again. Segmenting your customers by behavior and stage in their lifecycle ensures that you’re providing the information they need at the right time. While other kinds of segments—like those based on demographic and email activity information—are important, consider the power of using customer lifecycle segments to nurture and promote product engagement from zero to hero. What has your experience been with motivating people in each lifecycle stage? Do you have a different model for user progression? We’d love to hear!